The winter months provide me with time to read. If I could, I would curl up in front of a wood fire and read non-stop for four months. Unfortunately, family, job, snow-shoveling and cross country skiing interfere with my reading time. I like to think that the camp community works in exactly this way. I have spent twenty-six summers at Nominingue, including five years as director. Camp Nominingue belongs to both the ACQ (Association des camps du Québec) and the OCA (Ontario Camps Association). Within each of these organizations there are between 100 and over 300 camps. Once a year, each of these camp associations holds their directors’ conference. It is a chance to meet, to learn, to reminisce and to improve. Although I do not know every director, the support network within the camp community is incredible. When I have a question, I have numerous people who are willing to listen, offer advice or share their own experiences in a similar situation. Last fall, a group of OCA camp directors met at the Nottawasaga Inn, led by Jane McCutcheon of Think Muskoka. Jane, an ex-camp director now working as a consultant, shared her thoughts regarding the challenges facing camps today. Jeff Bradshaw, director of Camp Wenonah, shared some of his marketing genius with the group. The central theme that Jane and Jeff presented was that camps “must adapt to the needs and demands of our clients! This is the new reality.” Beyond the ideas generated at the meetings were the informal discussions that took place throughout the day. I discussed with Lisa Wilson of Camp Oconto and Matt Bernardo of Camp Wabikon about the management of the kitchen. Over the last year, I have picked the brains of Leon Muszynski of Camp Arowhon and Mike Sladden of Camp Pathfinder regarding their tripping programs. I have discussed with Dave Graham of Camp Kandalore regarding the approach he takes in recruiting international campers. I also regularly speak with Jeff Brown of Camp Otterdale on a wide variety of topics. This spring, the ACQ organized a meeting of Anglophone members to discuss our perspective and any concerns that English camps might have within the Association. The meeting enabled many of these camp directors to connect for a first time. Since that meeting, I have discussed with Don Sedgwick of Sans Souci Riding Centre issues of common interest or concern. Whether it is discussing new ecological ventures, staffing issues or transportation, Sean Day of YMCA Camp Kanawana is always available. Jacqui Raill of Camp Ouareau has been an inestimable resource in working with the association or in referring me to the best contact. 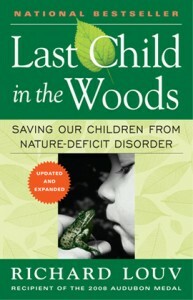 Richard Louv, in his best-selling 2005 book Last Child in the Woods, coined the expression nature-deficit disorder. He is careful to remind the reader that this is not a medical diagnosis. The term describes the effects that nature deprivation can have on people. Recent studies suggest that alienation from nature appears to have the following effects: increased attention difficulties, higher rates of both physical and emotional illnesses including depression, and a higher crime rate. Representative of the situation today is the comment made by a four-grader: “I like to play indoors better because that’s where all the electrical outlets are!” Children today prefer playing indoors rather than outdoors. There is no doubt that television and computers encourage this situation. Parental concern about child safety outside the home is another contributing factor. In his book, Louv identifies and discusses the many causes of nature-deprivation present in our society. He asks the question, “Should we be concerned?” He responds strongly in the affirmative. And finally, he calls for action – in education, in individuals, in families and in communities. Where does camp fit into this model? Obviously, summer camp is not a complete and comprehensive solution. Campers head off to camp for sessions between a week and two months. If camp is the only time a child experiences nature, the effect will likely be only short-term, but if camp arouses the sense of wonder in the child to the natural world that surrounds him or her, if it provides experiences that lead to personal growth, the effect of summer camp can be life-changing. At Camp Nominingue, campers travel two hours north of the Montreal. They roll into camp down a kilometre long road through a pine plantation. Set on the shores of Petit Lac Nominingue, the camp site covers 400 acres of woods, fields and tree farm. Nominingue offers an outdoor experience to campers between the ages of seven and sixteen. All campers live in tents, a wall tent set on a wooden platform with beds and mattresses. After lunch on arrival day, campers are asked to turn in their cell phones and I-pods to the office. That is part of their experience at Nominingue. During the course of their stay at camp, campers will have the opportunity to go further into the wilderness on a canoe trip. The youngest campers travel on an overnight down the lake; 10 to 13 year olds will travel for three to five days in Parc Papineau Labelle, located a few kilometres south of camp; while 14-16 year olds will travel two hours further north to Parc La Verendrye for a seven to ten day experience. Rise free from care before the dawn and seek adventure. Let the noon find thee by other lakes and the night overtake thee everywhere at home. We want our campers to feel at home in the outdoors. We teach them outdoor and canoe tripping skills, and offer experiences that we hope they will want to repeat outside of camp with their parents and later, with their own children. Going to summer camp in itself will not ensure that children learn to love the outdoors, but given the right experiences, it can encourage a life-long love affair with nature, camping and canoe-tripping. The purpose of this blog is to share some of my thoughts about Nominingue, about camps and, I guess, about life. I enjoy reading and I plan to mention a number of books in this blog.